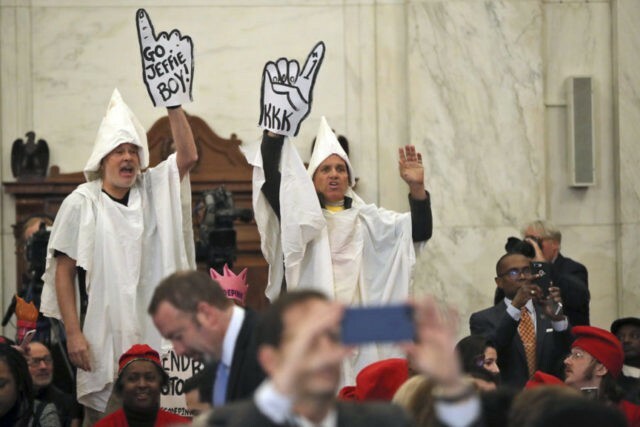 WASHINGTON (AP) — Protesters disrupted Sen. Jeff Sessions’ confirmation hearing for attorney general on Tuesday, including two men wearing Ku Klux Klan costumes and a woman wearing a pink crown. The conservative Alabama senator, who is Donald Trump’s pick for the nation’s top law enforcement official, faces concerns over how committed he would be to civil rights. Civil liberties advocates have expressed concerns about Sessions’ voting record and his appearances before groups that espouse harsh views on Muslims and immigrants. The Alabama Republican was rejected for a federal judgeship by the Senate Judiciary Committee 30 years ago amid accusations of racial insensitivity.